Danielle BonJovi wants to have fun in the sun poolside, but she has to bring her “service” dog with her. Unfortunately the condo association for the Fountains At Countryside, in Clearwater, Fl., has rules against dogs without service documentation being poolside. According to BonJovi, Maui started out as an emotional support animal, and in an interview with WFLA said she “wanted to train him to be a service dog to assist me with my disabilities”. “I have a letter from my psychologists, stating that I have a disability. That is covered by the ADA and also covered by the Fair Housing Act and the Rehabilitation Act of 1973,” said BonJovi. 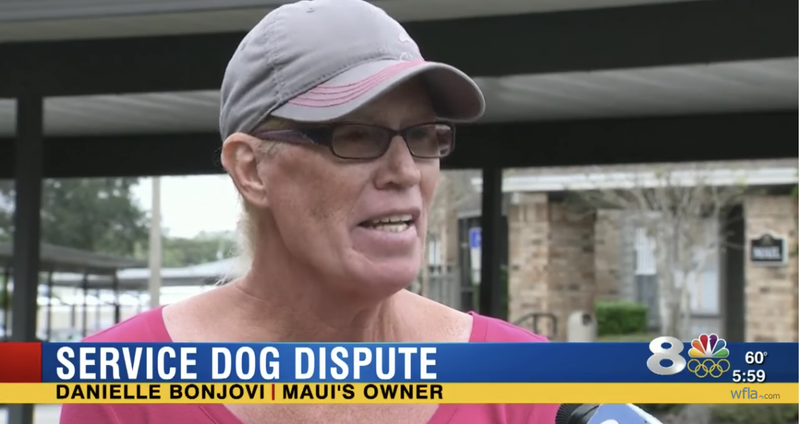 But if BonJovi can’t prove Maui is an actual service animal, by submitting the proper documentation, the condo association says she’ll be fined $100 every time she brings the dog near the pool. Sounds like a simple way for BonJovi to prove Maui is indeed a service dog is to submit the documentation, right? There’s no word on whether or not BonJovi’s dog is an actual service animal, because she would not allow the condo association to make copies of the documents she showed them. Either way, BonJovi or Maui won’t be poolside until the paperwork is submitted.